A rare zebra left the National Zoo yesterday to help reverse his endangered status. Dante said his last goodbyes to the zoo yesterday before getting into his trailer to embark on a new journey. 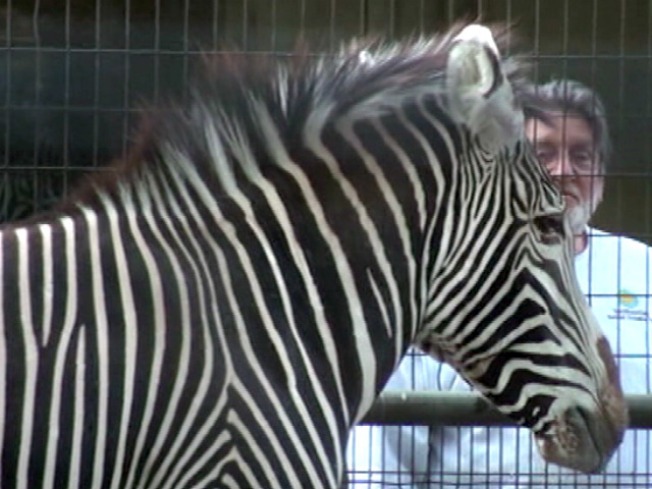 He's off to the Great Plains Zoo in Sioux Falls, S.D., to find himself a zebra honey. His spiked mane and large, rounded ears, specific to Grevy's zebras, may just help him get lucky. The four-and-a half-year-old zebra is part of the National Zoo's Species Survival Plan, because his breed is listed as endangered and is rapidly disappearing. As part of the survival plan, the zoo doesn't breed Grevy's zebras, and houses only males, nurturing them into adulthood. "Then when they get to the point where the males are becoming less compatible where it's more dangerous to hold them together, just like in the wild... we start to separate them and they get recommendations to move on to the grownup zebra world," said Tony Barthel, the zoo's large mammal curator. Now that Dante has grown into his stripes, it's time for him to get lucky. "They go off to meet the girls and to add their genes to the gene pool," Barthel said. He worked out the plan much like an expert matchmaker, with breeding recommendations based on genetics and pedigree. After Dante is settled in his new place, the introductions will begin. "They’ll probably start with him getting used to the routines, him in the adjacent enclosures and then him in the female enclosures. Then they put them together," said Barthel.